Ebonee Lyons actually looked forward to doctor’s office visits as a child. 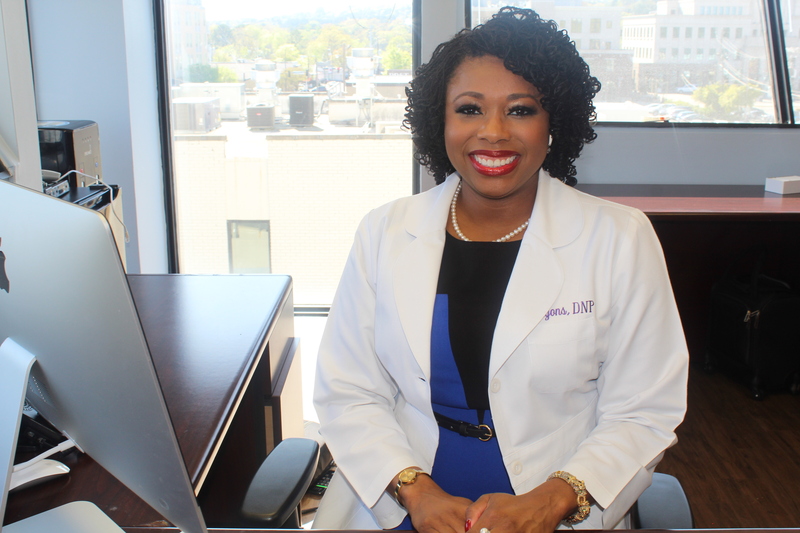 Lyons has been a nurse practitioner since 2010, and in December 2018 she opened Lyons Family Care in the Regions building in Homewood, Ala. The medical practice focuses on telemedicine, holistic care, disease prevention, and health promotion. “I like people to understand why we’re doing what we’re doing, why [they’re given a certain] medication, what to expect if for some reason they don’t feel better, or what to do next if the medication doesn’t agree with them,” she said. Lyons believes telemedicine, designed for patients who cannot physically come to the office, helps with her health services by enabling her to provide care via telecommunications. What’s new, she said, are people with unlimited access to cell phones. Telemedicine allows more flexibility because people are often on the go and don’t always have time to visit an office. Still, Lyons advises patients in need of urgent medical care to go to an emergency room. She added that telemedicine doesn’t necessarily replace regular visits to the doctor’s office. Lyons, who is in her mid- to late-30s, has practiced for nearly a decade. She began her career in 2005 as a registered nurse in Birmingham and became a nurse practitioner after graduating from Samford University. Five years later, she earned a Doctor of Nursing Practice (DNP) degree from the University of Alabama, and she holds a board certification as a family nurse practitioner. “I felt like it was really important to get some experience in each type of field, so I am able to help people better and be ready for any type of work setting or work environment,” she said, adding that her first job after graduate school was in pediatric primary care at Birmingham’s Metro Pediatrics from 2010 to 2015. Lyons said technology has changed the way people interact with medical providers. Lyons likes that she has a small office where she can build a good rapport with patients. The Lyons Family Care office, which also includes a medical assistant and staff, works by appointment and responds to messages very quickly. Lyons knows the benefits of telemedicine on a personal level. While traveling out of state for nurse practitioner work in a rural area, she needed an urgent-care facility—and the closest one was a two-hour drive away. Lyons is also certified in California and Arizona and can assist patients in those states. With mental health, it is important that people make time for self-care. To learn more about or make a telemedicine appointment with Lyons Family Care, visit www.lyonsfamilycare.com or call 205-512-6419.